Avatar as Real Life-human – respectfully remediated based on an augmented approach. Avatar as Non-human – respectfully remediated based on an immersive approach. Avatar as Pseudo-human – radically remediated based on an augmented approach. Avatar as Sentient object – radically remediated based on an immersive approach. I don’t mean to imply that the possible tension between e.g. professionalism and play only occurs between the NW-SO corners – I believe this tension (as well as the other tensions) can be identified within the whole sphere. Being a work in progress I’m currently settling for identifying key elements and placing them in the model, but if thorough investigations prove these elements to be relevant and viable I will improve the graphics. NW: Mariis Mills, my main avatar who is a respectful remediation of my real life person. Though I have to admit, that she looks both younger and cuter, I do sense that my students recognize her as a reflection of me. NO: Mew Aeon, my co-facilitator who at present chooses to represent himself as a cat because it goes well with his first name and playful nature. 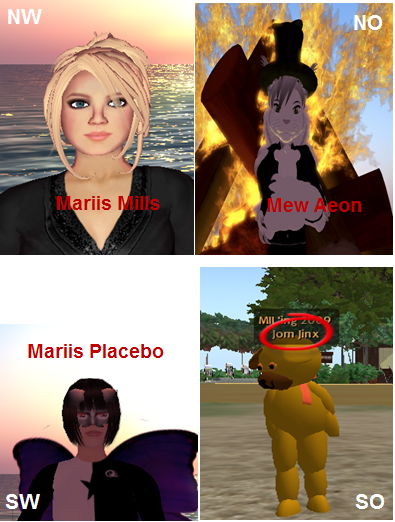 SW: Mariis Placebo, my main alt who is currently a humanoid super heroine with butterfly wings and special powers. I use her when I need to work undisturbed in-world and she’s also member of a number of groups that are only peripherally connected to my field of study. SO: At a certain point MIL student, Jorn Jinx showed up as the – in Denmark – very famous teddy bear, Bamse. Though Bamse clearly is an object, it is usually referred to as a male persona and associated with the ability to feel and perceive subjectively. I think the avatars above represent the more moderate examples of the four achetypes, but it will certainly be possible to identify more extreme cases as in this excellent interview moderated by Hydra Shaftoe (a wolf) for Nokia on the topic of Perceptions of Non-human avatars or as in this Orange Island Identity Summit, where e.g. qDot Bunnyhug is represented as a sentient rectangular box. Does in-world teaching include anonymous acting? Besides the roles 4 and 10, which are directly linked to the subject matter in the cases and 3, which of course is distinct for teaching in virtual worlds, I don’t think the identified roles differ that much from conventional teaching – at least not when I compare the list to my own and my colleagues teaching at E-Learning Lab in general, and at MIL in particular. Teaching in an age heavily influenced by new technology and the Internet, in my opinion, naturally calls for multiple roles of the teacher, it is however interesting to see the roles listed, which also is one of the reasons why I recommend this article to my students. I do believe that one of the great pedagogical potentials in avatar-based teaching and learning lies in the possibility to role-play, and I suppose Jolly and his colleagues were trying to enhance authenticity by acting out different characters. Want I don’t understand, is the need for anonymity, and I have to say that this example oversteps some of my personal ethical boundaries. Wouldn’t it be possible to role-play without anonymity, I mean, doesn’t acting exactly entail that you assume a different character? To me one of the most important roles of the teacher – if not the most important – is to be trustworthy, and that simply doesn’t align with acting anonymously in my point of view. I’m greatly puzzled by this, since Jolly in so many other parts of the article expresses some very emphatic and sympatric thoughts. The 3 cases were conducted mainly at closed islands in-world, and I realize that the students were aware that they might encounter anonymous project staff members, but I still find it problematic to use anonymity like this in an educational context. Nevertheless, the article makes for interesting discussions on the whole anonymity issue of online teaching and learning, and I’m looking forward to hearing my students’ responses to this. Nielsen confronts my “to feel part of .. even if ..” phrase, which may seem illogical if you really believe that technology can provide a sense of embodiment. I guess this stems from my talks about SL. It’s my impression that 3D technology still is rather exotic to most people (even 2D! ), and I think I might lose credibility if I started a talk by stating that this is real! Perhaps I underestimate my audience, but I do feel that if you’re not familiar with online behavior and haven’t been immersed in a 3D setting it may seem surreal … And I know that some people who actually are familiar with e.g. online learning do not feel the way I do. (…) a ‘system’ of meanings by which the phenomenological process of recognizing and ‘sensing’ objects takes place, and it is through the medium of the body that we get to ‘experience’ and ‘perceive’ the world: ‘Our own body is in the world as the heart is in the organism: it keeps the visible spectacle constantly alive, it breathes life into it and sustains it inwardly, and with it forms a system’ (Merleau-Ponty, 1962: 203). This may be what Downes refers to, when he states that “we’re pattern recognition devices” though I’m not sure Downes would label himself as a phenomenologist. Anyway, Dreyfus inspires me, because he is also influenced by Merleau-Ponty, but I have to say that we read and interpret Merleau-Ponty in different ways, and that forces me to reflect on my own position. In 2001 Dreyfus published the book “On the Internet”, and if I had to point to one single reason why I wanted to do a PhD on 3D-mediated teaching and learning potential this is it! A short comment to this could be that our bodies do not go (anywhere!) when we engage in internet activities – like the heart in the organism we’re bodily grounded in the world regardless of how it presents itself to us. Furthermore I’m pretty sure that millions of Internet users find meaning and learn skills no matter how they perceive reality. But my intention in this post is not to review and comment on Dreyfus’ entire book, where he of course elaborates this and many other points. First of all, I’m in the beginning of my research and I still lack insight and sufficient academic competencies to do so in a reputable manner, and I certainly do not want to seem disrespectful. That specific comment just triggered my research and for that I do feel appreciative to Dreyfus. Second, other researchers have already presented arguments against the Dreyfus claims, and in this post I want to point the reader’s attention to Ray Land. What is puzzling about Dreyfus’ analysis is how it seems to take no cognizance of the many risks to identity, confidence, emotional security and esteem that are encountered on a daily basis by participants within online learning environments. Ajana, B. (2005): Disembodiment and Cyberspace: A Phenomenological Approach. Dreyfus, H.L. (2001): On the Internet. 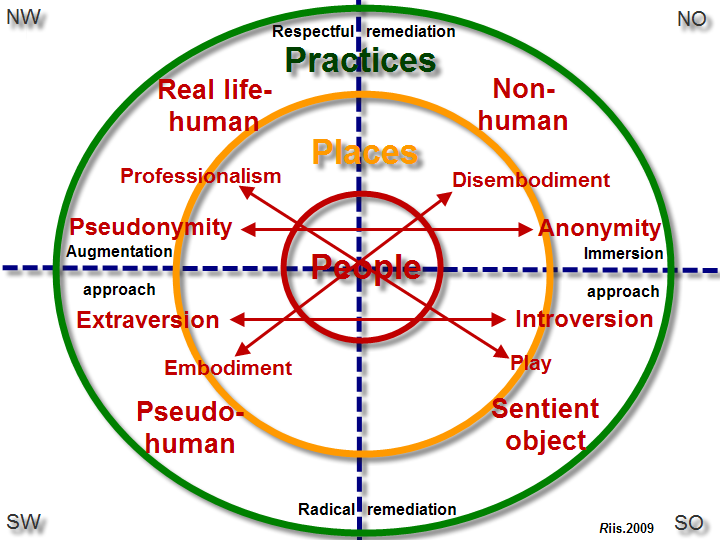 Land, R. (2004): Issues of Embodiment and Risk in Online Learning.